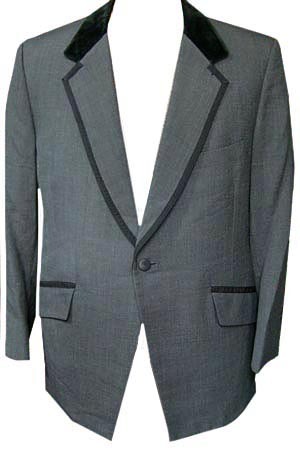 Vintage 1970s men's medium grey tuxedo jacket. Made by Lord West. Feels like a blend, but no material tags. Black velvet collar and fancy black ribbon trim along the wide peak lapels. Same trim on the pockets. One black plastic button closure and 1 decorative button on each sleeve cuff. Center back vent. 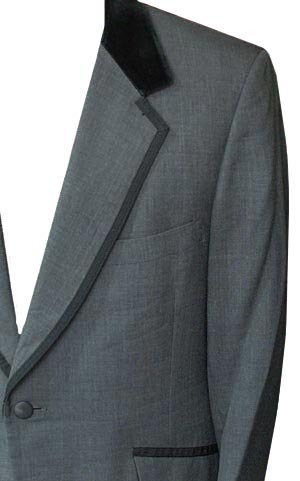 Very classy 70's tux jacket for prom or a party!